For new, multicore CPU Folders, be aware that SMP WUs have bonus points, with more bonus points the faster you finish the WU. However, the bonuses only come into effect after you have completed 10 SMP WUs. It is also advised not to switch to -bigadv Folding until you have qualified for these bonuses. Again, you will need to submit 10 SMP WUs before you begin getting bonus points. 1. V7 client, download links. 3. 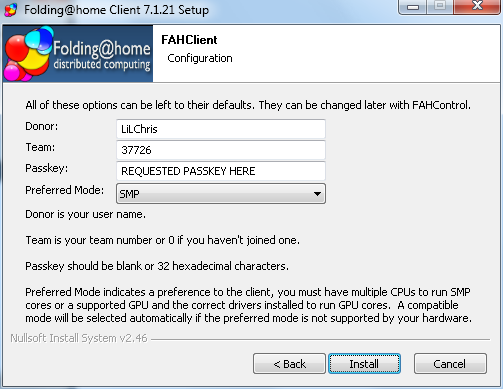 A Folding passkey from Stanford. You can request one from here. This is not needed if you are only Folding on GPUs. 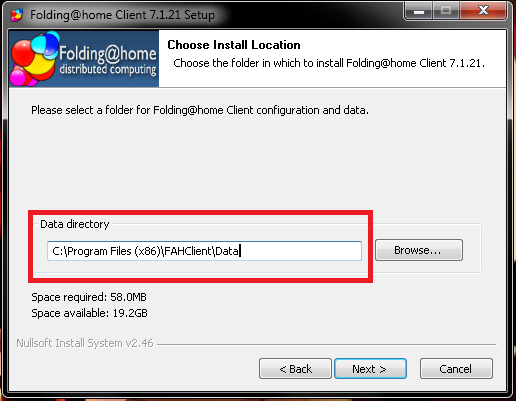 However, it is essential for the SMP/Unicore clients. 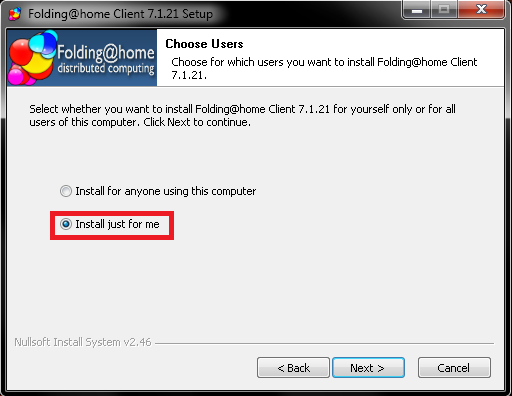 1) Run the install file for the Folding client. 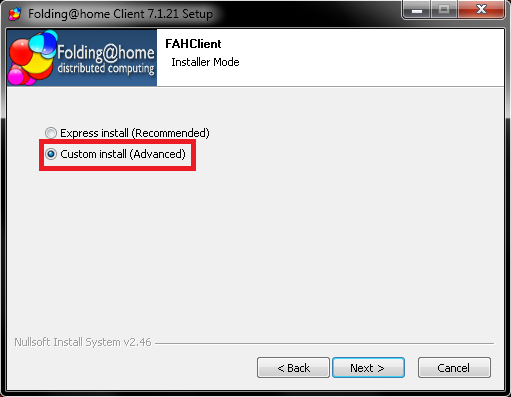 When prompted, choose "Custom install" then select "Install just for me"
A warning will appear, just ignore it and click Ok.
3) Following screen select Next and leave everything at the default recommended settings. 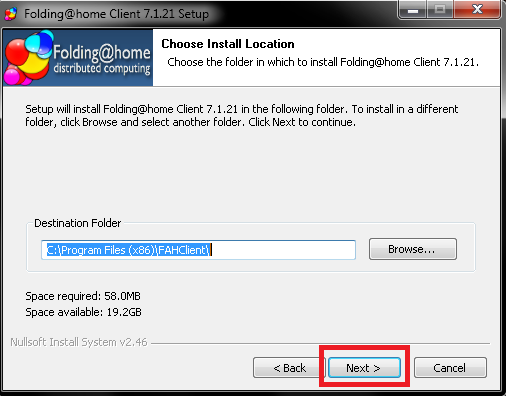 5) You are now done installing the v7 client and now SMP folding! 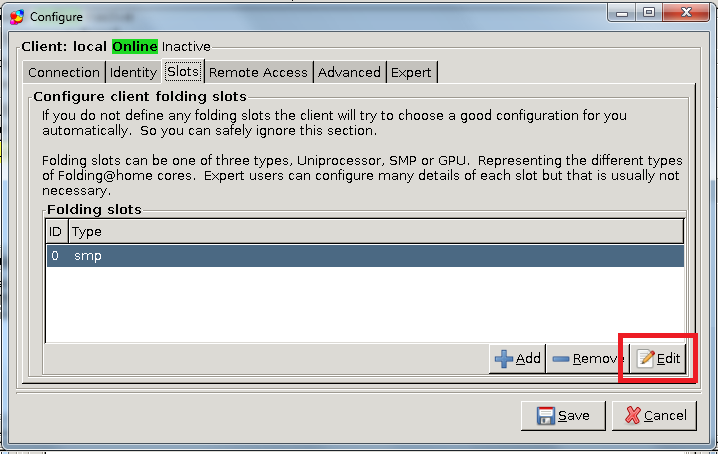 Hide & Quit - Hide will minimize to systray and Quit will exit the client. 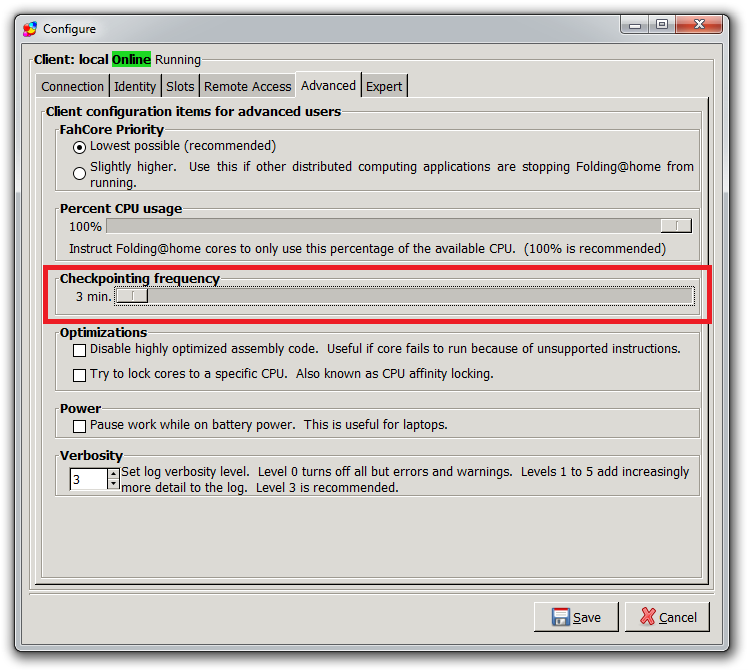 Closing it by clicking the [X] in the top right corner will also minimize it to the systray. 1) Click the "Configure" button in the top left, and go to the slots tab. 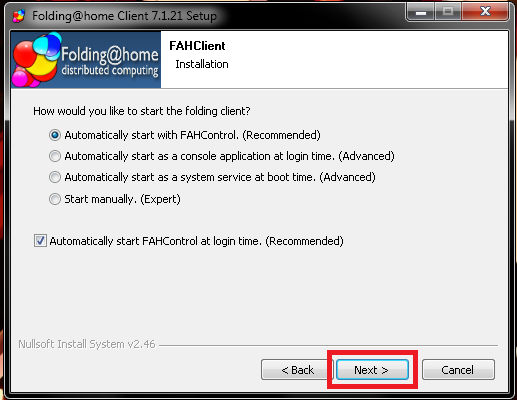 2) Highlight the "smp" slot, and click "Edit"
4) Restart your client by rightclicking it and choosing "Fold". You should now be receiving -bigadv WUs. O_O Awesome! I'll probably use this tutorial later this week. Thanks! Nice writeup! Just used it, very simple. On a side note... is this the end of HFM? No a update should be out, and I will continue to use it since it carries work unit history and other great features. A friendly reminder: don't forget to set your checkpoint frequency to 3 minutes (from the 15 minutes default) in Advanced settings! Yup more information will be posted later when Z and I get time to organize it. Thanks for the guide, I was wondering if I can add my PS3 into my clients list to monitor as well? I did add it in but it shows offline, I am guessing that the PS3's network connection is disabled when folding? Any way around that or will it just detect it when the WU is uploaded from my PS3? No idea on the PS3 stuff since I do not have one, your going to have to ask Z about that. Very neat. I JUST installed the v6 stuff earlier today not knowing this was about to drop. I had to go through all the cmd prompt stuff for smp. Now it looks like it's simplified?? Looks nice.